The finishing touch on any bike is the details. 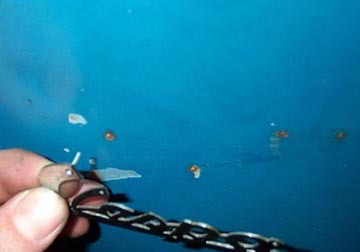 This section will show how to put on an old style legshield badge using rivets. A block of metal or something similar to hit against. The first thing is to make sure the holes are clean and will fit the rivets. 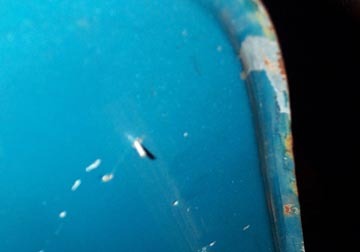 The holes can sometimes close up a bit with a thick layer of paint or rust but they can be carefully cleaned out with the rivet itself. 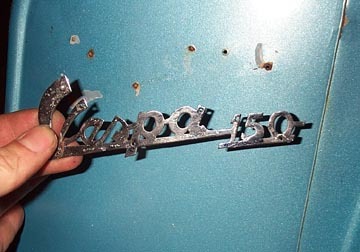 There are a series of holes in the frame badge that will correspond to holes in the legshield. Insert one of the rivets in to the badge and push the rivet through the corresponding hole in the legshields. It should poke out the back side about 1/4" which will have to be trimmed before it is hammered flat. Here's a shot of the rivet sticking out the area where your knees go. Go one rivet at a time. 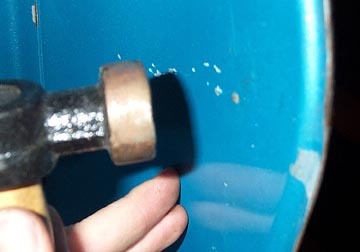 Trim the back of the rivet with pliers so that you leave less than 1/8" showing. 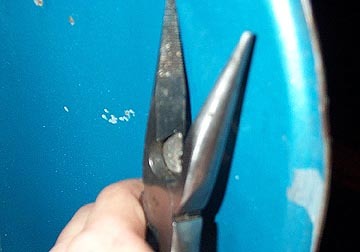 Be sure to push from the badge side before cutting to be sure the badge is firmly up against the sheet metal.